So have you seen those amazing super chunky throw blankets in all the high end stores? They are full of big texture and modern elegance, and are amazingly cool in any room! 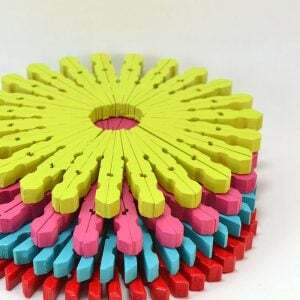 It’s a hot trend started by crafts people on Etsy, and massively went crazy in the style world. But, they are waaaayyyy expensive. We’re talking hundreds of dollars folks. Here’s the thing… would you have ever guessed that you can make these giant knitting projects? Even if you are not a knitter, and with no tools? And for less than $40? It’s called arm knitting, it’s hot, and it’s EASY. 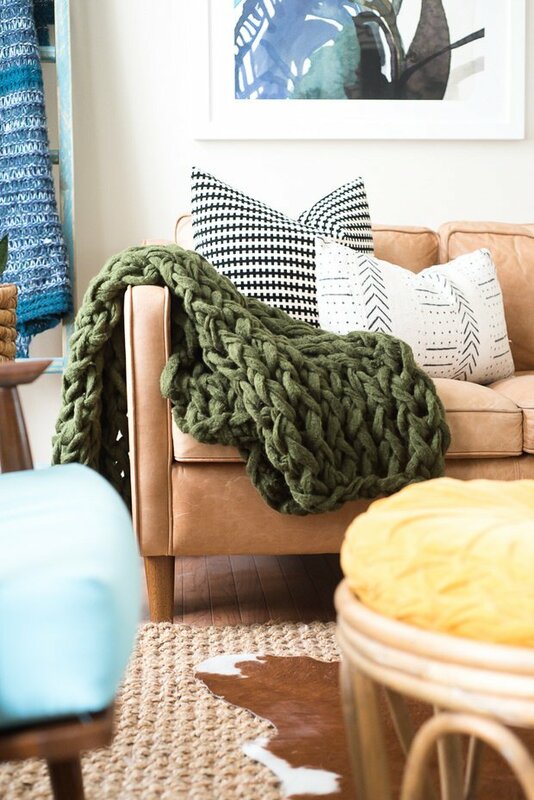 These tutorials will walk you through it visually, and we included some resources on where to get the super chunky yarn used in these amazing chunky throw blankets. We included tutorials from several different bloggers because they all have a different take and different tips. We suggest looking through them all, then pick the tutorial and blogger that resonates with you. Then go for it! Our first photo below is from ‘Made Up Style‘. 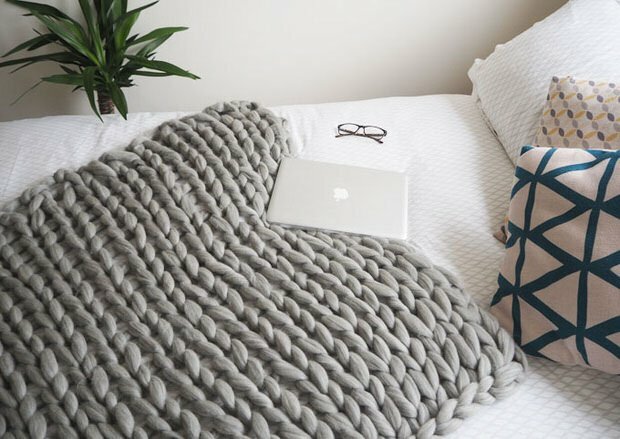 This blogger from the UK uses wool yarn in her blanket. Learn how to make an arm knit blanket from Aniko at ‘A Place of My Taste‘. She has a full video tutorial, and she also writes down the step by step, so if you need reminding along the way, it’s right there for you. Love the color she chose! And I love the yarn she used because it’s affordable, but really textural. It’s called Premier Jazz Couture, and we used it in blush ourselves to make a Christmas gift that is loved. Daily. Unfortunately, you can’t find the blush anymore, but our next choice is the light gray. You can find that yarn at Amazon. ‘Love of Home‘ has a tutorial for the most affordable of these projects at about $30, and she uses a yarn you can easily find at Micheals. Her arm knit throw DIY is perfect for beginners, and she did this in about an hour and a half! ‘Simply Maggie‘ can show you how to arm knit a blanket in less than 45 minutes! She has one of the first, and still best arm knitting videos out there. If you are ready to get a little fancier, learn how to arm knit a basket weave from her while you are there. (The blue one, below.) Look at that texture! This one from ‘Simply Maggie‘ is a basketweave stitch! 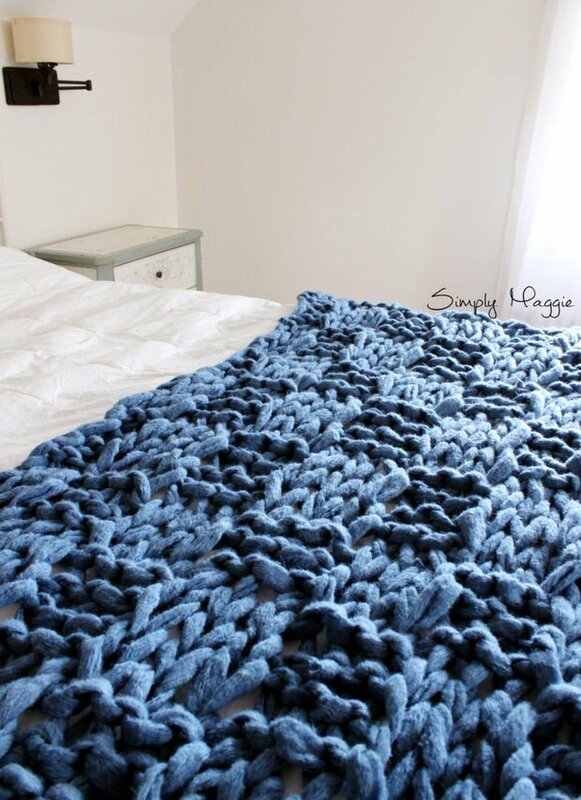 ‘The DIY Mommy‘ used the video tutorial above from ‘Simply Maggie’ to create an arm knit blanket in less than an hour! You have to go check out the yarn she found to use…. It’s really interesting as you read these tutorials to discover how you can customize the look with yarn choices and colors of these chunky throw blankets. This last one is for those of you who want to go all out with high quality wool, (she has a resource for you!) which is gorgeous but definitely much more expensive. (Still not as expensive as buying one!) 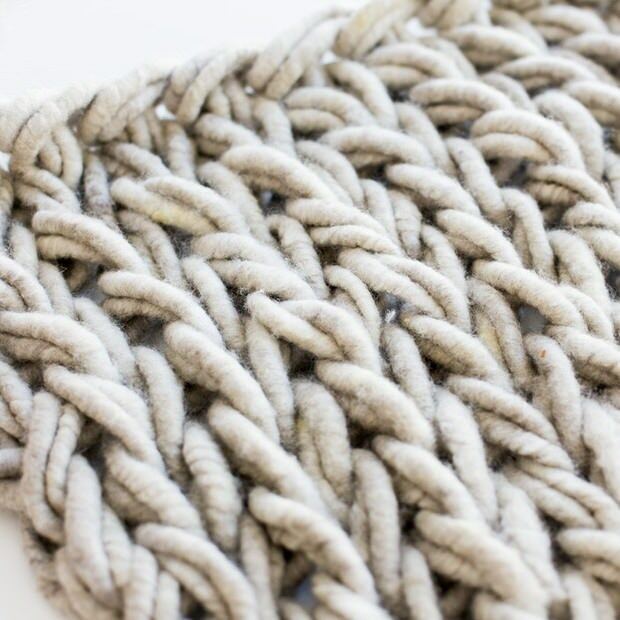 Make a chunky arm knit throw from ‘Happy Happy Nester‘. So these are incredible, but if you don’t want to DIY this, but just have to have one (and it fits your budget) you can buy them! We found out fav online at ‘Nickel N Co.’. Beautiful with Australian wool! It is over $500, but look at it! It’s amazing! I will be making one of these easy chunky throw blankets myself, in white or grey I think, we will update with photos when it’s done. So excited about this project, I’ve wanted one of these for awhile! Let us know in comments if you make one, and how it turned out! Update : We made one in blush! Will be posting photos soon! Our daughter LOVES it! This has become one of our most popular posts for a reason! 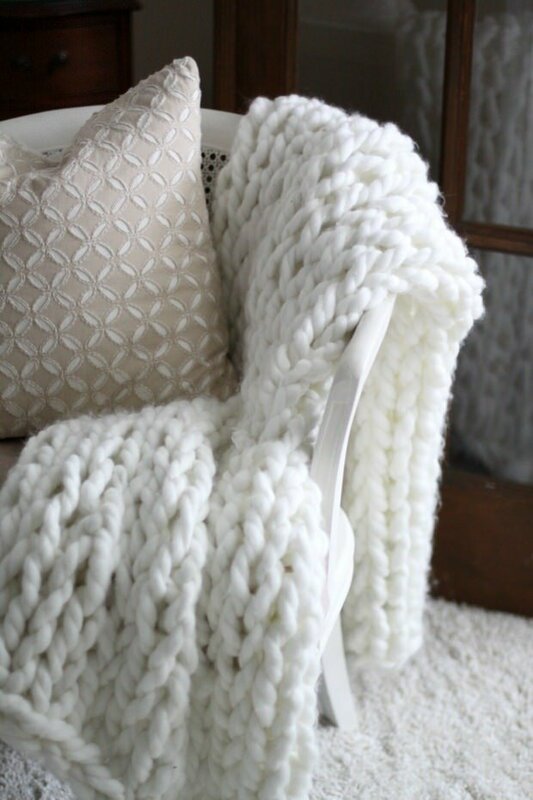 Love the great texture and luxe feel of these arm knit chunky throw blankets, but don’t wanna try these? Ok, we have had some feedback that some people want to just buy one of these cool blankets instead of make them. Gotcha. 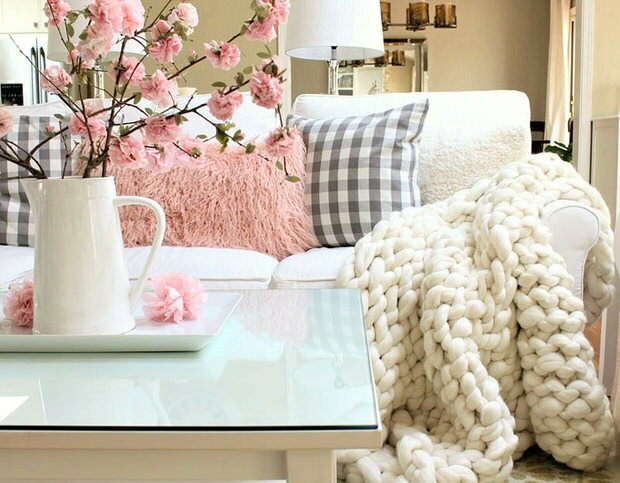 Here is our pick for a cool chunky knit throw blanket (we love the blush and the gray!) that you can buy for less than $100, at Bed, Bath & Beyond! Or, you can check out handmade ones from artists at ‘Ebay‘. Still, under $100! 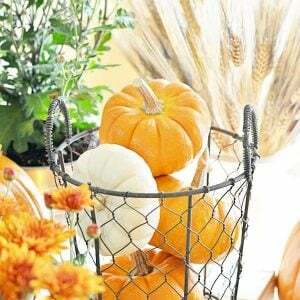 You might also like our post on How to Make a Perfect Hotel Style Bed, or our post – Hygge Decor : Cozy DIY Projects for Fall & Winter on our sister site – OhMeOhMy! 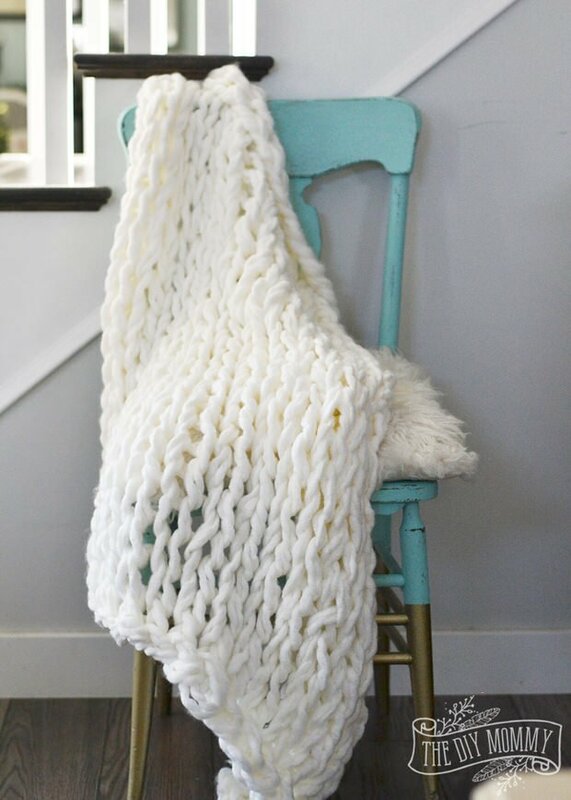 Image Credits: Made Up Style, A Place of My Taste, Love of Home, Simply Maggie, Simply Maggie, The DIY Mommy, Flax & Twine, Happy Happy Nester, Nickel N. Co.
Hymns and Verses Etsy sells one of these large knit throws for $200. 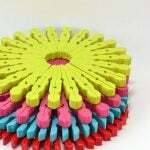 Thanks so much for sharing all these great DIY’s. Decorating with home textiles is a great way to simply transform a room, while also providing a function. Thanks so much for sharing my post! I’m actually wrapped up in my throw as I’m writing this comment! I Love it so much. It was easy to make, so have fun making yours. If you have any questions let me know. My blog post has a few tips that I learnt along the way! Hi Janine! 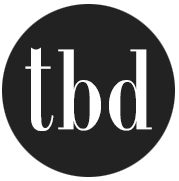 Boy that post has been popular this week, I think readers love it as much as we do! May take you up on tips, I hope to make mine really soon before the weather starts warming up so I can enjoy it! 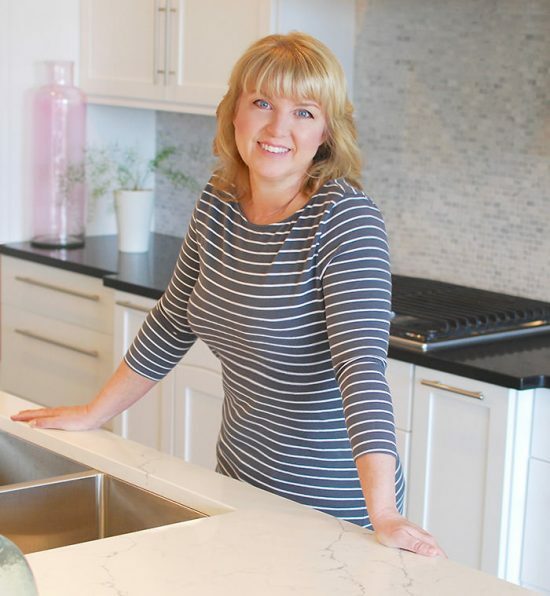 Thanks for such a great project Janine! I love your project so much Janine! Its a really popular post on our site, so I know our readers love it too! Thank YOU! I need to know how much yarn I need to make a twin sized blanket. Can you help me? Hi Krisin! Read 2 or 3 or the tutorials, the different bloggers give you tips on how much they used… I used 6 skeins to make a throw size blanket… Good luck! Ok so I have really short arms I guess I’ve tryed to make these throws from another pattern and can’t get enough stich on my arm. Ok, I have super short arms as well, you are not alone! My husband has to shorten his arm in order to hold my hand. I made my chunky throw and I basically had most the stitches located from my elbow to my hand. So, you can scrunch them all together! Trust me you can do this! Let me know if you have more questions. 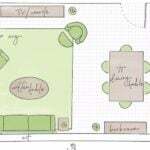 I have my DIY on my blog. Try using a PVC pipe. Cut to the length you need.? Thanks for sharing this. Really an amazing DIY idea for making the blankets. I would also like to make my own blanket, thanks for this post. 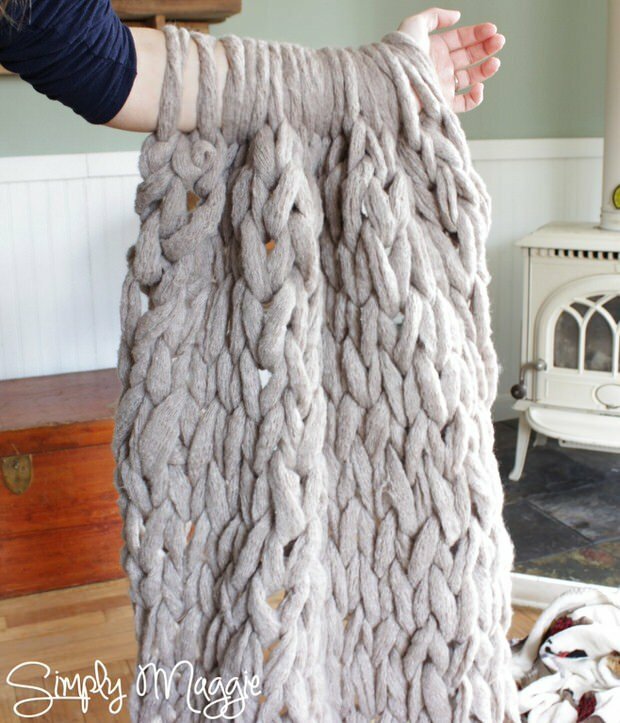 Great DIY for making this arm knit blanket. Really a nice post to read out. I will also try one. Thanks for sharing this. Hi there. You said that the yarn would cost around $30. The prices I am finding are much higher, any suggestions? Where do you get the yarn? Hi Marisa! There is a link in the post with suggestions, but I found some both at Hobby Lobby and most of the projects have suggestions within them. Hope that helps you! How manny bundels did you need? See some of the other comment replies! I’m not sure about using wool yarn… All the pictures make the blankets look silky, not wool style fuzzy/scratchy. I’ve tried looking up a kind of yarn that feels silky smooth, but I’m wondering if anyone else has found something like what I’m looking for. Maybe I just don’t know enough about wool and it CAN feel silky? Thanks for the post, I can’t wait to eventually make my own! Saved! Anyone know a reasonable supplier in the U.K. So how many bundles of the yarn should I buy for a decent size blanket? I’m trying to make one for my boyfriend who is 6’2 for his christmas gift. Most of the tutorials share some guidance among these lines, read more than one tutorial to get a good feel for it… I used 6 skeins to make a good sized throw blanket… Steve is 6’3″ and it covers his lap pretty well, but its not a sleeping size blanket for him… Hope that helps! Hi Kathy! For the yarn you linked to, how much should we buy if we want to make the blanket? The site doesn’t specify and I don’t want to be short on material. Thanks in andvance! Which tutorial are you following? It all depends on the size blanket you are making, I used 6 skeins for more! Hope that helps! Love these ideas. Absolutely amazing. I do make some things with the wool yarn. Just love it. How do you clean the blanket regularly? Would it hold up well in the washer/dryer? I would wash on delicate, and line dry! do I go to do that. PLEASE AND THANK YOU> would really appreciate it. Hi Mona! Each of the blanket projects has a link back to the original blogger, if you contact the one that correlates with the blanket you are interested in, they may have printable version for you! Great article. Couldn’t be write much better! I found yarn at Micheals for 5 dollars per skein/25 yards. Using a half off coupon it would cost 15-20 dollars!